One criticism I don’t share, however, is the criticism about the need to have the Ribbon UI at all. I can understand that the Ribbon isn’t popular as it means you have to relearn a complete new UI paradigm and I have to admit that I have my problems to learn it. I have been using the Excel menu for more than 16 years now, learned all the commands and shortcuts and now I feel like I felt when I opened Excel 4 the first time. I would invest the time in learning the Ribbon if Excel 2007 did not have all the other problems mentioned and criticized above, that still hinder me to use Excel 2007 in a productive environment. Jensen Harris and his User Experience Team did a very good job at Microsoft designing the Ribbon as a new UI paradigm for feature rich applications like Microsoft Office. You can learn about the design process and design considerations of the Ribbon in Ribbon UI Blog. I participated in the non-public and later the public beta and enjoyed following Jensens blog. You could see that Microsoft really cared about Usability and good a User Interface. You could see from build to build how the Ribbon UI developed and got better and better. But then one build the new Office 2007 UI Themes were introduced and all my enthusiasm for the Ribbon went away. The new themed UI got all kinds of glow effects, effects of light you should avoid in Data Visualization and Effective User Interfaces. I’ve opened Paint and redesigned the Ribbon UI applying the Rules of Effective Chart Design. Basically, I got rid of all glow effects and effects of light, and replaced the Office Button with the classical File Menu. This presents a clean, visually easy to scan, User Interface that still has all the advantages of the Ribbon UI. Maybe Jensen Harris will read this post, so Jensen please keep up the good Usability work at Microsoft. But please, Pimp Down My Ribbon! I know the Office UI team worked very hard on the Ribbon, but I think their usability studies were flawed. The feedback they based much of their preliminary design upon required that users’ computers were able to send feedback to Microsoft. Most of Microsoft’s big users, the large corporations with thousands of users, have IT protocols that block this kind of feedback, and many power users decline to send this feedback in any case. This feedback I believe was only available for users of Office 2003, and many big users don’t upgrade as rigorously as Microsoft would like. So a huge segment of Office users were discounted, and these users were the more knowledgeable users. The result is that any new interface based on this information would be skewed towards inexperienced users. In their efforts to reduce complexity, the UI team did two things. They reduced flexibility. And they didn’t remove complexity, they distributed it among the various tabs, making experienced users work harder to do what for them are routine tasks. I like your efforts here to clean up the ribbon (is that Andreas? your articles should have a byline). I would have “MicroCharted” the ribbon (and I still may, if I ever use 2007 enough to want to customize it), by shrinking the huge ugly buttons, to allow more buttons to fit. For example, that Paste monolith could be shrunk, and in addition to Paste, you could fit Paste Formats and Paste Values in the same space. I can feel the excess mouse clicks melting away. I don’t mind the glow effect, as long as it is useful. In the ribbon, it indicates the selected option (in the ribbon clip above, it shows that the Align to Bottom of Cell vertical alignment option is selected) and it indicates which button the mouse is hovering over. The un-pimped ribbon in contrast doesn’t indicate the selected vertical alignment setting. I understand the issues you have with the organization of the commands of the ribbon. Its simply unacceptable to have such an important command like Paste Values three mouse clicks or three key strokes away, it shouldn’t be more than two mouse clicks. Let me think how this could be reorganized and / or how this would fit into another tweaked Ribbon. I don’t think that is necessarily a bad thing having large buttons. Usability studies are indicating that is makes a lot of sense to have larger icons for more important commands and smaller or no icons for less important functions. Also having a mix of small buttons, large buttons and controls might look like unclean design, but helps you to remember and memorize the position of commands. They serve as a visual sign posts. Like the trees, and houses all the non-uniform environment elements that makes it easy to orientate in a new city, whereas it is hard to orientate in a city with a clean, uniform architecture, where all streets looking the same. It’s also a supporting Jensen’s design decision to not to make the Ribbon customizable (well, via code you can). These visual sign posts that help you to learn the ribbon need be stable. Imagine how confusing it would be, to go to work and to discover, that half of the city was reconstructed over night. I hardly can see where a glow effect can be useful in the user interface of a production tool like Excel. All the reasons why we remove the visual clutter from Charts apply for User Interfaces. I changed the un-pimped ribbon so that it indicates the selected vertical alignment setting via a darker border and a slightly darker background color. The usability studies have overemphasized the needs of new users and light users of Office, at the expense of heavy power users. Not being able to readily customize my interface cuts into my flexibility and productivity. Re the glow feature. In previous versions, a selected option appears as a depressed button, or as a checkmark next to a menu item, and in 2003 there is also an orange highlight on the depressed button or checkmark. A “highlight: is reasonable, while “glow” may be a bit excessive, though we’re getting stuck in the land of semantics. By the way, one complaint about Excel 2007 is that the light light gray highlighting of selected cells is hard to see on some screens, and is particularly hard for vision-impaired users and middle-aged users. I would suggest a more pronounced highlighting for your selected vertical alignment button. 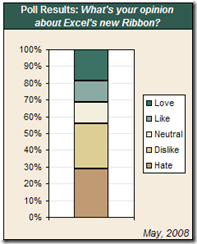 It makes sense to me that 56% of respondents had negative opinions of the Ribbon. The one fundamental concept that Microsoft missed in implementing the Ribbon-only UI (removing the classic menus) is that not all people are visual by nature. Based on the numbers you quote about 56% are probably not. I, like many others, am not visual by nature. Menus provide a text-based contextual path to the specific function I want to use. I can always find what I need using the classic menu design. I have been using Office 2007 since it was released and I still can never find the same command twice on the Ribbon. Often I am staring right at the icon and don’t see it–not because I’m blind but because the collected icons create a visual soup that essentially blurrs to one big picture making it hard to find the specific icon. Your effort to clean up the Ribbon would certainly help, but for people like me, the real solution is replacing the Ribbon with a menu system–which I have done with ToolbarToggle (see ToolbarToggle.com). Hello, does anyone has an example about adding a TAB included 1 or more buttons from which each button can be connected to a procedure and/or function? I hate being critical, I really do. I used to teach Excel classes and I knew almost all of it by heart but I hate this new version. It’s extremely pretty but on most of my machines the version takes forever to load the various views and it’s just killing my productivity. Not too much having to find where everything is and understand what command names were changed. You know as much as I hate to say it but it really is a lot of criticizing on their end. It seems like a lot have been added that aren’t much of use in the first place.